Why would an English teacher need to take a business trip? That's the first question I would ask upon reading the above title. Has my company gotten so powerful that I'm now flying around the country just to teach? Well yes and no. Or no and yes if you want me to answer the questions in order. My company isn't that powerful yet, but yes, I recently took a plane up to Sapporo in Hokkaido not exactly to teach, but to test the English ability of some employees working at Mitsubishi Denki. Why it was necessary for me to fly up there instead of having the students take the test by phone is beyond me, but when my company asked me if I wanted to do it, I was like 'Business trip? Cool. Hokkaido? Great! Get of of Tokyo for a bit? Awesome'. After a crowded train ride (god, the trains are crowded in Tokyo even at 6:30 in the morning!) a plane ride that I barely managed to catch, then another train ride from Chitose Airport, I finally got to Sapporo around 10:30am. I was hoping for snow, but Sapporo was warmer than Tokyo! 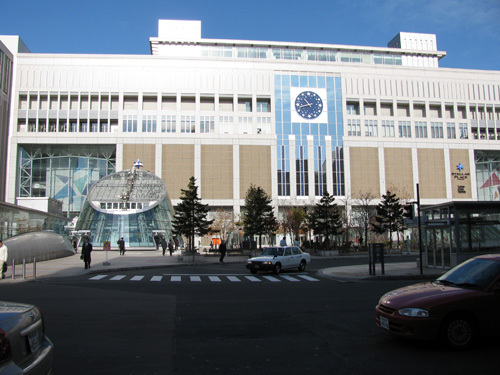 Here's Sapporo station. This is only the center building. It's flanked on both sides by two even larger buildings. Sapporo isn't as big as Tokyo, well what city is? But it's still pretty big. Having to work didn't give me much time to walk around and actually see the city, but my company arranged the ticket times so that I'd have a couple hours of free time after I was done to do whatever. Whoever built Sapporo must have liked squares. The city is built on a grid which means that when walking around trying to find buildings, etc. there are only 4 ways to go: North, South, East and West. A nice change from the madnesss and chaos of Tokyo where streets go any and every way except straight, and you need to worry about 360 different directions. 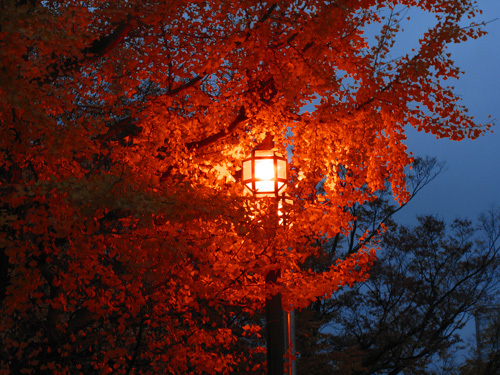 Unfortunately for me, it started to get dark just as I finished (around 4pm), the days are shorter in November after all. It also began to rain lightly. Super. 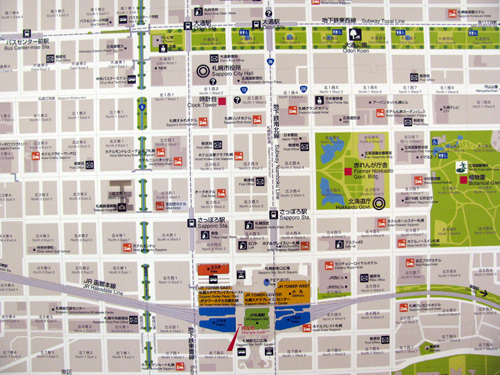 Off to Odori park which you can see on the map above (long thin park near the top). There's Sapporo tower in the distance (well I just called it Sapporo tower, not really sure what it was). Not as tall as Tokyo tower, but hey, it's tells the time! 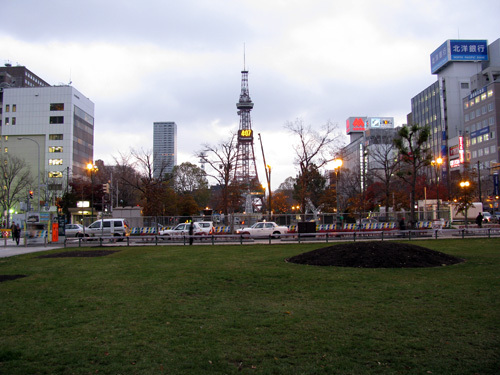 Still walking down Odori Park. This is a nice stretch of park! Every block has a section, and each section has something different in it, and it stretches on for a loooong way. 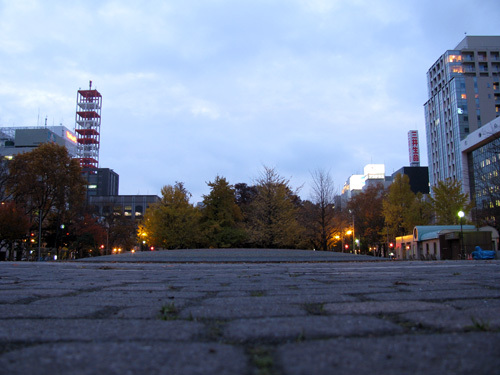 Another shot from Odori park, probably the best shot I took today. Managed to get a little fall colour action before the daylight faded. One thing you may or may not notice about Sapporo, but I did, there are no power lines criss-crossing the streets! Must be all underground. So many times some ugly power lines have gotten in the way of what would otherwise be scenic views in Tokyo. Good job Sapporo. Went to city hall, but it was too dark to get a decent shot, and I didn't have my tripod so... off to the Clock Tower! 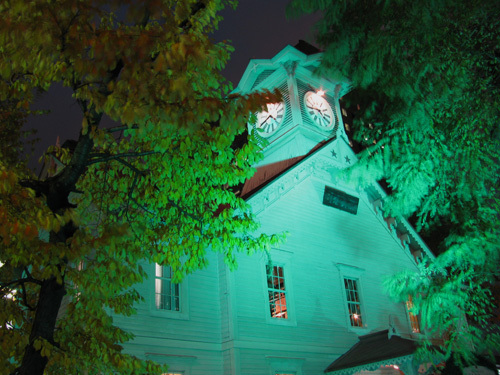 Everyone talks about the Clock Tower in Sapporo, but don't ask me why. I mean, it's just a clock tower. Anyway the blue light made it kind of cool, and I guess other people thought so too as there were trigger happy people all over the place. Then, after buying a few Sapporo goodies like corn chocolate, I headed back to the airport and a packed, uncomfortable flight to Tokyo where I arrived home late, and dead tired. Traveling between classes by plane might sound pretty high powered and cool in theory, but in reality it's overrated. Getting to the airport, waiting for planes, small seats, crowded flights, who needs it? Now, if I was flying business class? Well that would be a whole different story.